If thats not fake we need to go hunting. Man I really like this mount. It looks like he is fixing to charge someone. where did he shoot him at? AGAIN I HIT THE FLOOR IN WORSHIP. WHERE IN THE HELL DO YOU HARVEST SUCH KINGS YOU MUST BE ONE PROUD HUNTER. GOOD FOR YOU AND WE SHOULD GO HUNTING TOGETHER SOME TIME"""""""""""""""""""""
Is this some record or what!!!! How many of these mounts are fake or have been bought? Hey robby, I bet she shot him in the heart or the lungs, most people do. That must be a FARM RAISED deer come to Az and se the real deal!!!! hey! Bowhntr#1 from az where are you from? im from Payson! 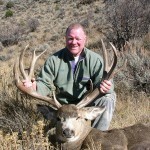 You arent lying, az is were the big boys roam!I will shoot you an e-mail and maybe share some info. 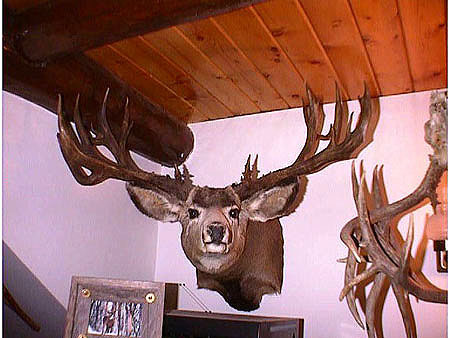 yea arizona has some nice mule deer. your just jealous that this one did nt come from there. idaho now thats where the deer are. were are these deer loacted like what state are they in? Now that’s a cute face…BUT IT’S A MONSTER!!!!!!!!!!! IT’S HUGE! HOW MANY POINTS???? look these deer arent fake they r collected and bought so stop sayin that. this is so stupid you can tell all of these deer are FAKE!!!!! Bucks like this are few and far between. Once in lifetime man. You should be proud of that no matter what anyone says about it !!!! One nice buck! really "one shot meat in the pot" how’s that?